Hearables have landed and I'm excited. While wrist-worn wearables have stolen the headlines, and there are many useful ones in my life, I'm never without a pair of headphones. They're really the original wearable. When you add the likes of smart features, sports sensors and voice assistants, headphones become hearables. And devices like the Here Active Listening, Bragi Dash and Samsung's Gear IconX are all pioneering this exciting new category, enabling us to finally ditch the cables to live and play unencumbered. For the past month, I've been living the wireless dream. Switching between the Bragi Dash and the Motorola VerveOnes+, there's been a mixture of positive and negative experiences. When people have spotted me using them, the first statement is always the same: "You'll end up losing them." I can't say I've been close to misplacing them and they have not once fallen out of my ear. When I'm not wearing them, they either go in a pocket or in the front of a rucksack. They also spend a lot of time in their case, and there's a good reason for that which I'll get onto in a moment. Another positive is that I didn't get many weird looks. While the Bragi Dash are slightly larger, these are essentially in-ear earbuds minus the cable trailing down to a phone. So back to that case. It looks like cases are going to be a big deal for wireless earbuds (at least first generation ones) and not just because they're the best way to make sure they don't get lost. It's the battery life. 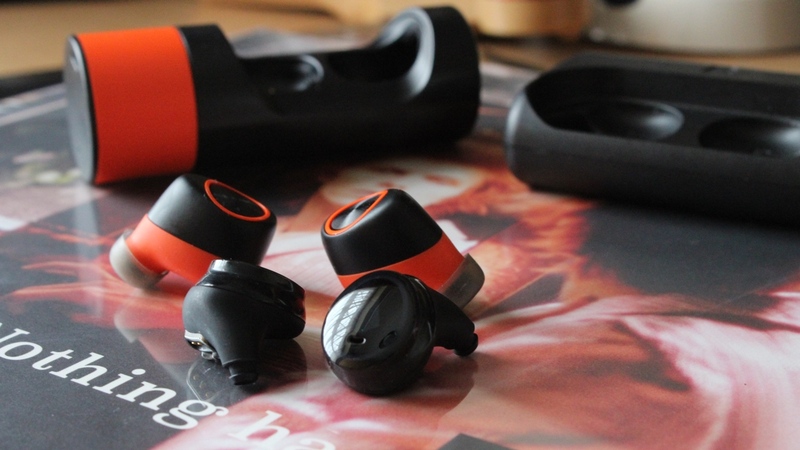 Having also played around with Samsung's Gear IconX, it's become quickly apparent that battery life for wireless earbuds is going to sit somewhere around the 3-4 hour mark. When you consider that there are plenty of Bluetooth headphones out there that can offer double that, it doesn't sound all that impressive. Three hours is fine for a day's commuting and a session in the gym, but not so much if you're planning on running a slow-ish marathon with them. Yes, the case can charge your smartphone as well and power up the buds relatively quickly, but I'll be happier when I can get through a week like I can with the JayBird X2 or Jabra Sport Pulse. No cable also means that controls have to go somewhere else, and the solution right now is turning the outside of the earbuds into buttons and using touch sensitive controls. That means swiping or double taps to switch between controls. With such a tiny space to play with, that can be tricky and quickly becomes frustrating. There's a slow learning curve and you really have to time those interactions perfectly. I can't tell you the number of times I've unsuccessfully tried to double tap to skip a track. So what about the smarts? This only applies to the Dash because the VerveOne+ are simply earbuds for streaming music and nothing else. We've already gone into detail about what we think about the Dash's fitness tracking prowess (or lack of it), and spending more time with it hasn't altered that fact. We're waiting on software updates to drop, but it hasn't happened yet. The lack of GPS is extremely disappointing – but also understandable given the size. There's only one example of GPS-packing headphones I can think of and that's the very underwhelming Sony B-Trainer. The problem is that without GPS, proper fitness tracking is seriously undermined. What's the point of owning a pair of svelte, sensor-packed earbuds if you need to take your phone along for the ride each time? In the case of the Dash, you've got an accelerometer to track activity and that won't satisfy serious athletes. The heart rate sensor is something we've already seen headphone makers play around with and the jury is still out on how much more accurate it is than the wrist, if at all. Connectivity is without doubt my biggest gripe and that's a criticism I can level at both sets of buds, though more so with the Motorola ones. Without getting too technical, both rely on Bluetooth connectivity to pair buds with a smartphone. It's a matter of radio waves replacing cables to connect the two together and placing the Bluetooth radio inside the buds to create that connection. Bluetooth connections can become patchy when there's interference from things like other wireless devices or power sources. On scale of 1 to 10, with 1 being terrible and 10 being fantastic, the wireless buds I tried are somewhere around the 6 or 7 mark. It quickly becomes apparent that they don't like it when you're using them with other Bluetooth devices paired to the same smartphone at the same time. When running, simply moving my phone hidden inside a running belt to behind me had a big impact on Bluetooth interference as well. We shouldn't forget these are earphones for listening to music and when you spend the kind of money that Bragi and Binatone are asking for them, it's perfectly reasonable to have expectations. Sound quality will not blow you away. It's good, but not spectacular. I wanted more, although, I imagine, it will be good enough for most. So have I been won over by wireless earbuds and this new wave of hearables? Mostly yes. This is the future, but there's still work to be done here. The smarts need to get smarter and there's still some technical tinkering to do. Granted, there'll be limitations with such a small area to work with, but I have every confidence they will get there. Eventually. If wireless earbuds are going to be the hot commodity within the next twelve months that Doppler Labs, creators of the Here One, say they will, then I hope that those issues I've experienced get resolved. Because while hearables might be the original wearable, they've still got a long way to go.